If you read various Catholic blogs, it might appear that there is no constructive dialogue between traditionalists and reformers. This is indeed often the case. However, it is wonderful when a middle-of-the-road approach is taken and produces results. One of my better experiences in recent years occurred on January 8, 2003. 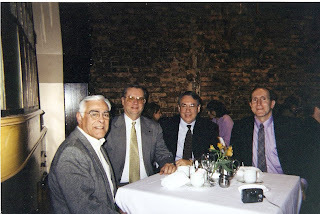 On that day, the executive board of CORPUS (national association for an inclusive priesthood) and the president of the NFPC (National Federation of Priest Councils) spent a day together in New York City. Highlights of our day included constructive talks on the role married priests could play in various dioceses around the country. This was inclusive of a very nice lunch in an Italian restaurant in Manhattan. I have included a photo taken at the lunch mentioned in the preceding paragraph. From the left are Bob Silva (former president of the NFPC) and the former CORPUS executive board, including Bill Wisniewski, Russ Ditzel and Ray Grosswirth (yours truly). I continue to pray for the success of the American Catholic Council, scheduled to take place in June of 2011 in Detroit. It will be an opportunity for conservative and progressive Catholics to come together in a spirit of friendship and dialogue. I look forward to attending and participating in the conversations. If you have been followers of my blog, you are aware that I often speak of my Judeo-Christian background. Part of this background was inclusive of distant relatives in the former Austro-Hungarian Empire, which was later to become absorbed as territories of present-day Hungary, Poland, Austria and Slovakia. With a Roman Catholic history on my mother’s side of the family, I have generally been supportive of the canonization process when sainthood is bestowed upon righteous persons. For example, in terms of the papacy, I have no problems with the canonization of either Pope John XXIII or John Paul II. Most notably, as a young man, John Paul II was part of the Polish underground that worked against the Nazis. I do find the canonization process underway for Pope Pius XII to be somewhat problematic. While he was certainly not guilty in any way for atrocities that took place during the Holocaust, an open question remains as to how often he spoke out against the Nazi regime. 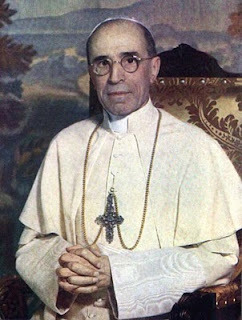 In the video that appears above this post, I tried to be sensitive to persons on both sides of the debate underway concerning the canonization of Pius XII. I tried as best as possible to provide a historical perspective concerning the late pontiff. In the final analysis, I don’t think he should be demonized in any way. At the same time, however, there was perhaps more he could have done toward saving the lives of countless Jews who were trapped in the terrible events of World War II. There were certainly Catholic saints during the Holocaust period. Many were priests, nuns, bishops and lay Catholics, who worked tirelessly in their efforts to provide shelter to Jews whose lives were in danger. Many of these heroes ended up suffering the same fates of Jews in concentration camps. Whether or not Pope Pius XII deserves to be named amongst the saints remains a hotly-debated topic. I personally don’t feel Pius is deserving of sainthood, and I hope my video will give a credible argument against his canonization. 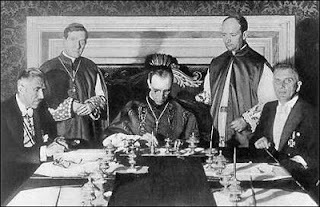 As you watch this video, you will notice that I produced it in black and white, utilizing film effects that were characteristic of the period Pius XII occupied the papacy. ROME (Reuters) - Nobel Peace Prize winner and Holocaust survivor Elie Wiesel, in a major speech to Italy's parliament, attacked wartime Pope Pius XII on Wednesday for his "silence" during the Nazis' mass killings of Jews. Wiesel, an Auschwitz and Buchenwald survivor, gave the emotional speech on World Holocaust Remembrance Day -- also the 65th anniversary of the liberation of the Nazi death camp at Auschwitz. At about the same time German-born Pope Benedict, who has defended the actions of his wartime predecessor, was also speaking about the Holocaust at his general audience at the Vatican across the River Tiber. "Whether at the lowest level of politics or the highest level of spirituality, silence never helps the victims. Silence always helps the aggressor," Wiesel told parliamentarians and top officials including Prime Minister Silvio Berlusconi. A source in Wiesel's entourage later told Reuters the words "highest level of spirituality" were a reference to Pius, who headed the Roman Catholic Church from 1939 to 1958. The question of what Pius did or did not do to help Jews during the war remains a burning issue between Catholics and Jews, and Wiesel's reference to Pius indicated it shows no sign of being resolved. Ten days ago, Pope Benedict made his first visit to Rome's synagogue, where a Jewish leader told him bluntly that Pius should have spoken out more forcefully against the Holocaust to show solidarity with Jews being led to the "ovens of Auschwitz." 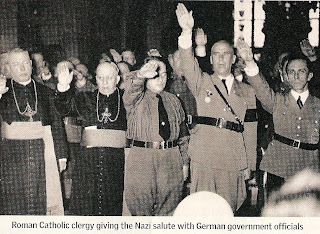 The Vatican maintains that Pius was not silent during the war, but chose to work behind the scenes, concerned that public intervention would have worsened the situation for both Jews and Catholics in a wartime Europe dominated by Hitler. At his general audience Benedict, who was drafted into the Hitler Youth and German army as a teenager during World War Two, called the Holocaust a "homicidal folly" that should never be forgotten. "With an emotional spirit, we think of the countless victims of blind and religious hate, those who underwent deportation, imprisonment and death in those abhorrent and inhuman places," Benedict said. 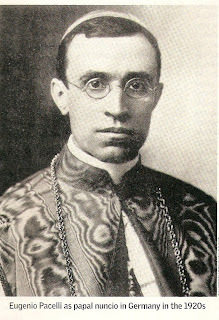 Jews have asked that the Vatican's wartime archives be opened up to scholars so the role of Pius can be cleared up. Let us continue to pray for tolerance and peace in our world. This is a departure from my routine postings. I want to take this opportunity to recall one of the more outstanding musicians to come out of the Rochester area. His name was Bob Guglielmino. He lived from 1945-1978. Yes, he was only 33 when he died, and I sadly remember how many people were numbed by the news of his passing. Bob Guglielmino was an extremely talented drummer, and many will remember his appearances with The Brass Buttons and The Gap Mangione Band. One of his more memorable appearances was on the Ed Sullivan Show, when he backed up Liza Minelli. I accidentally came across the footage in the video above when I was going through some old boxes. I then recalled that I filmed Bob in 1974 when he and the Gap Mangione Band were playing for a show at the War Memorial in Rochester. The footage is a little grainy, but I touched it up as best I could. I added some narration and I provided a musical backdrop (The Brass Buttons). My thanks to Bob Guglielmino for being a great musician and a wonderful person. His legacy lives on. I have not been doing a lot of blogging in recent weeks due to my hectic schedule (racing around the clock and averaging three hours sleep per night). On Sunday mornings, when I would normally be attending liturgies, I have been spending some quiet time lately in solitude to catch my breath after going 100-miles-an-hour the rest of the week. Needless to say, retirement looks good on the horizon. Many people have asked me how long I can continue to go at my present pace at my secular job. (I never take a lunch hour and I have sacrificed countless weeks of vacation.) On a positive note, I often tell people that I am at least fortunate to have a job in today's tight economy. However, at age 60, I constantly have to remind myself that I am going at a pace that would probably run down the average thirty-year-old. Despite my hectic secular job, I still find some time for ministry and I look forwad to officiating at a few weddings this year. In conclusion, please pray that I find some time for peace and quiet. I also ask that you pray for the five women who will be ordained on May 1.